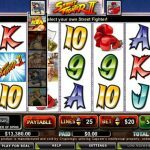 If you grew up playing Street Fighter well now you can play the same game from Amaya, Street Fighter II but as a video slot game, which is an adult version of the same game, since you can play it for real money. There are fighters on each side of the reels waiting for the bonus to begin and see who is the toughest. At the beginning of the game you have to choose a character, and that same character is the wild in this game. This symbol needs to appear on the second reel with Bison on the fourth reel at the same time to activate the main feature in this game. Those 2 reels become completely wild and the rest of the reels will respin. There are some new symbols on the first and the fifth reel: fists, boots, fists & boots and a star. This are actually all moves that will be performed by the fighters. If they appear on the first reel they are performed by your character, and if they appear on the fifth reel they are performed by Bison. You will receive prizes for every hit, and the idea is to defeat Bison. 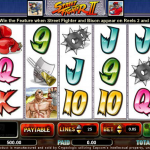 Street Fighter II is definitely a video slot game from Amaya that is worth the try. It does not matter if you liked the game or not as a child. 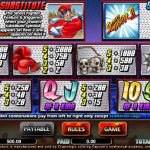 This is an action filled slot that has potential to bring huge wins your way. The feature is easily activated so you can improve your balance in no time. We really like how the overall game looks and we had so much fun playing it. So for that reason we believe that if you give it a chance you will too. For another great recommendation consider playing Spinning 7s a 5 reel slot by Amaya.